"When they tell you there's too much institutional demand but you never heard bakkt." - Timothy. While we're on the topic of institutional demand (or the lack thereof), CBOE just announced it's officially abandoning bitcoin futures. So, in other words, bitcoin is working as intended. The bitcoin community doesn't hold presidential elections, but if that was the sort of thing this community did, a non-trivial number of votes would go to Jack Dorsey. Today - after wrapping up his weeks-long bitcoin podcast tour with Stephan Livera, Joe Rogan, and Marty Bent - our dark horse candidate went on to announce the launch of Square Crypto, an initiative that pays developers to work on bitcoin infrastructure projects. To be sure, big tech companies funding bitcoin programmers to work on open source is not new. Take for instance Bitmain funding Bitcoin Core developer Jonas Schnelli a while back or Coinbase's Open Source Fund and Jim Posen. What impressed me wasn't the novelty of the thing, but the novelty in how the thing was socialized. Square Crypto's launch was so, how do I put it, tasteful? 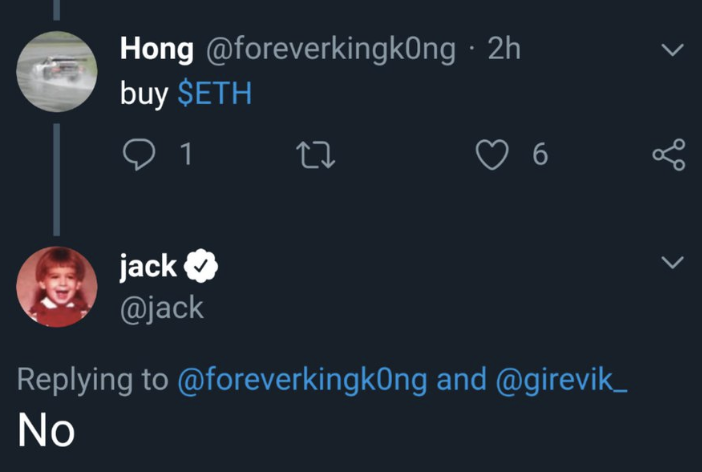 🔵 Jack is vocally opposed to altcoins and does not compromise his values to pretend to agree with users...of his own platform. As the CEO of a public tech company, you're encouraged to sit quietly and stifle your beliefs in public to avoid antagonizing users and stakeholders. As the CEO of two, I'd imagine doubly so. Jack stays true to himself. 🔵 Square Cash is emphasized as an open source initiative independent of business objectives. There's not much more I can say here other than FOSS = good. 🔵 The Square Crypto Twitter account only follows Hal Finney. It doesn't follow anyone from the Square team. It doesn't follow any contemporary crypto celebrities. Just good ol' Hal. The message the team's sending about its ethos is pretty clear: building > boondoggle. 🔵 Square Crypto is not only funding developers but a designer, too, to "help more people access this technology faster and better." "And to see [more work to educate]." The idea of using design as a means to help with education is a nice change of pace from crypto's default of simplifying and meme-ifying. To successfully explain complexity, focusing on the organization of the information is the way to go. Not on minimization or memification. Here's a good article on how dumbing down a message reduces the idea – making it smaller, lighter, and more easily dismissed. 🔵 They launched this in the middle of a bear market. Honestly, the only way this could have been more in line with bitcoin's ethos is if Jack was wearing a cap with UASF printed on the front and eating steak when he tweeted the announcement. Who knows, he probably was. Solving one of Lightning's biggest pain points: channels liquidity management. With Loop, users can get inbound capacity and withdraw from Lightning while keeping channels open. Most recent pod: The VC Outlook on Crypto’s Trends with USV's Dani Grant.